Your parents probably told you candy causes cavities – and they were right. But other factors do, too. In fact, risk for cavities is 60 percent due to genetic factors such as preference for sweets, teeth enamel strength and saliva composition, according to the University of Pittsburgh School of Dental Medicine. If members of your family often develop cavities, you might want to speak with your dentist about sealants or fluoride treatments. Genetics also play a role in gum disease. 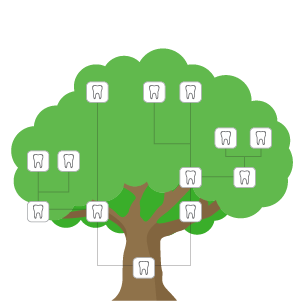 Family history can result in a predisposition for gum disease. If you have a family history of gum disease, stay extra vigilant about gum health by telling your dentist and looking for early signs. While it’s not genetic, there is a direct relationship between how children take care of their teeth and how their parents do. Children learn the importance of preventive care like brushing, flossing, visiting the dentist and eating healthy from their parents. If they aren’t taught this early on and don’t develop proper habits, they may overlook oral health, leading to problems down the road.